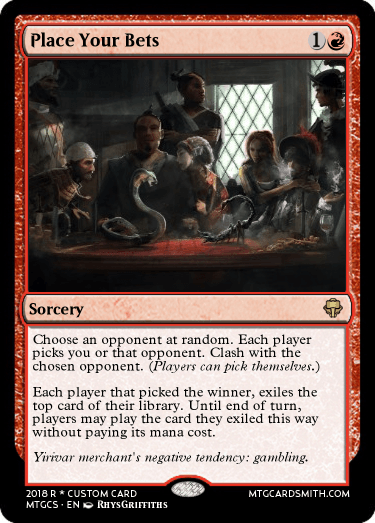 Hello fellow cardsmiths, we've decided that instead of doing our treachery contest, we'd do a contest on clashing. Mainly since it's less difficult to enter! Note: You do not need to use the reminder text of clashing. 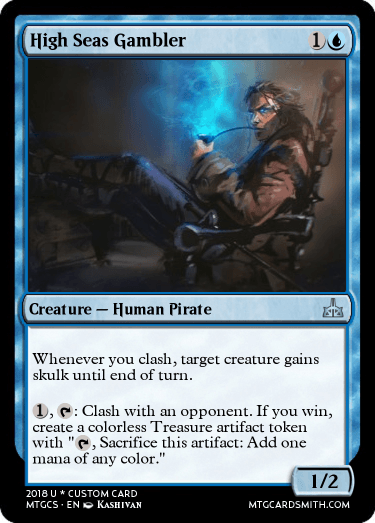 Existing Clash Cards: click here. - 1 month of premium subscription. - 3 favorites of your choice. - 2 favorites of your choice. 1) Card must use the clash mechanic. 2) You may make up to three cards. 3) Cards can be edited as long as the due date hasn't passed. 4) Cards can be switched out as long as the due date hasn't passed. 5) Cards can't be made before the 31st of March. 6) Make sure to credit the creator of the artwork on your cards. For help on posting images/links, look at this guide! Most cards involve the following, but aren't limited to them. "Clash with an opponent." 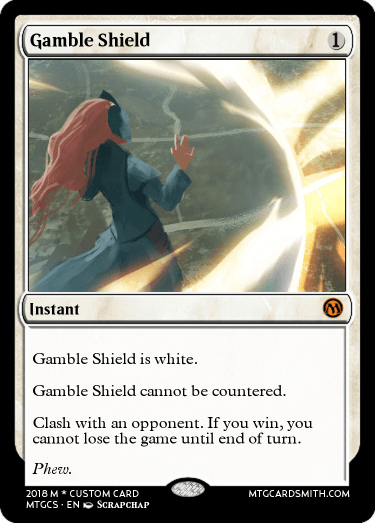 & "If you win,"
Some examples of how to use the mechanic in sleek ways. 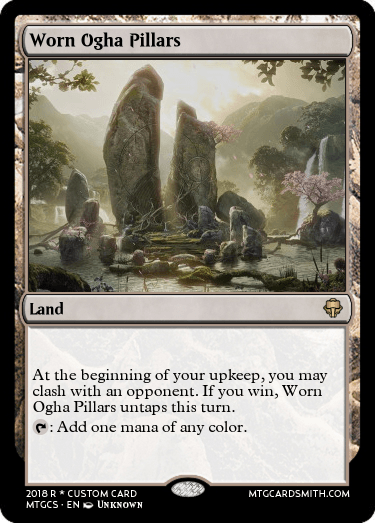 1) "You may clash with an opponent." 2) "Clash with each opponent." 3) "Clash with the opponent with the most life." 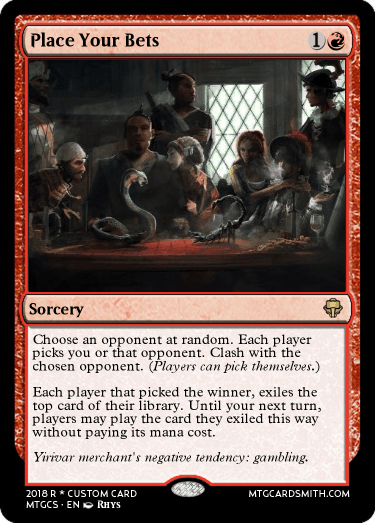 1) "If you do and win,"
4) "Each player with the highest converted mana cost card"
You can make a card for both contest! Trying to keep it Lorwyn. 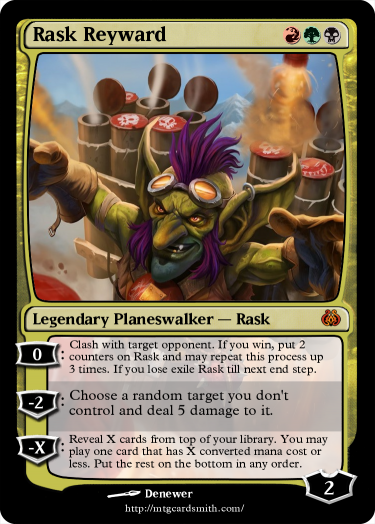 I decided to make a Planeswalker all about high risk high reward (hence the name.) He could be amazing or you might get nothing. 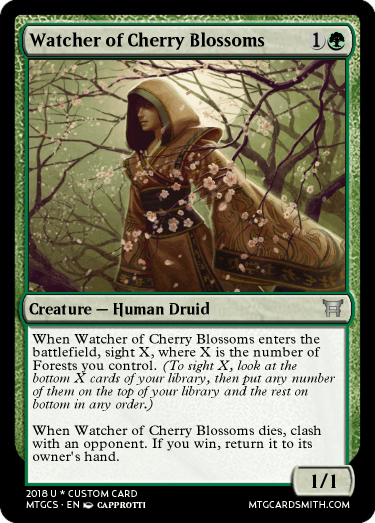 without paying its mana cost. I'll wait for other suggestions before I remake! Hello fellow cardsmiths, just a friendly request that you show some love to the following contests and challenges to help them gain more traction. 2) That's some nice combo game right there. 5) Wanna Play a Game? 6) WinnerIsTheJudge (Week 3) "Crossbreeds/Dual-Classes"
Closing this contest to entries. Thank you everybody for participating. Edit: A little early, but I decided it would be better to give the prizes out sooner. TenebrisNemo's entry is an elegant card advantage engine. Only surpassed by the beautiful artwork chosen for the card. As for Faiths_Guide's entry we have an excellent example of gambling that surely is sweet. Note: Honorable mentions are now optional due to the low number of entries. Which was mainly our fault as we hadn't bumped the challenge enough using honorary entries. This being due to sudden artblock. Prizes: For details on prizes, click here. @modnation675 - 'Tis a sad thing the amount of entries were low. My most recent contest had the same fate. I do not wish to choose a honorable mention this time. Congratulations, @Faiths_Guide! As for the premium subscription, would you add it to this account, as well? The premium subscription will be added momentarily. Since our contest is at the most recent post, I don't mind bumping our other contest. Please show your support in our new contest which we'll be posting more content. Oooh, congrats @TenebrisNemo! Thanks for the contest @modnation675. I get premium and 3 faves? Any specific cards you want favorited. Also, do you want the subscription on your main account? You can surprise me with the favorites, and yes, my main account would be great, thanks! Tomigon also gave you their subscription by the way. So you have two months!